Diabetics need to be especially careful of their dietary choices because they are unable to naturally control blood sugar levels. Type 1 diabetics don't produce enough insulin, which is needed to shuttle glucose from the bloodstream into cells. In contrast, type 2 diabetics produce enough insulin but their cells are resistant to its affect. Common Indian foods such as chapati and rice can be eaten by diabetics in moderation, but different varieties are better suited to diabetic diets because they have lower glycemic indexes. Consult your doctor about the importance of choosing foods with a low glycemic index. Carbohydrates such as fruits, vegetables and grains are not metabolized into glucose at the same rate. Some are quickly digested, causing spikes in blood glucose and insulin release, while others are broken down more slowly, which impacts blood sugar and insulin levels to a much lesser degree. The glycemic index is a comparative measure of how quickly a carbohydrate is reduced into glucose. In general, foods with index values of 55 or less have low impact on blood sugar levels and are considered most appropriate for diabetics. Index values between 56 and 69 are considered to have a moderate impact on blood glucose and insulin, whereas values of 70 or greater represent significant impact. The glycemic index of rice depends on whether the grain is polished or not, whereas the index of chapati depends on the type of flour used. Diabetics can safely eat all types of rice, although their portions should be moderated. In the production of brown rice, only the outermost hull is removed from the rice kernel. White rice is further milled, processed and polished, which reduces the nutritional value of the grain. In addition to containing more vitamins and minerals, brown rice is also a little higher in fiber, which causes your body to digest it more slowly. As a consequence, the glycemic index of brown rice is around 68, whereas long-grain white rice has an index of about 73. Chapati, also called roti or phulka, is a type of flat bread very common in India and other parts of Asia. Chapati is made from flour of a variety of grains and looks like a small pancake. 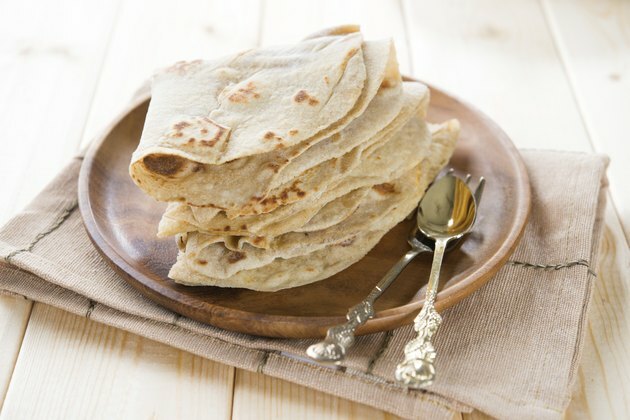 The most traditional type of chapati is made from ground whole wheat and roasted on a pan or baked in an oven. The glycemic index for whole wheat chapati is about 62. Chapati can also be made from corn, barley, chickpeas or refined flour called maida. Of these types, chickpea or besan chapati has the lowest glycemic rating at about 52, whereas maida chapati, which is often made with fruit and honey, has the highest index of about 89. If you are diabetic, eating either whole-grain chapati or besan chapati is an excellent alternative to eating regular sliced bread from your local supermarket, which typical has significantly higher glycemic indexes. Chapati is also a better staple than brown rice for diabetics, although brown rice contains many important nutrients and shouldn't be excluded from your diet. White rice has a higher glycemic index than both brown rice and virtually all types of chapati and is poorer in nutrients, so it shouldn't be relied upon as a dietary staple if you are diabetic.